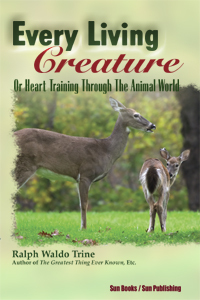 EVERY LIVING CREATURE or Heart Training Through the Animal World by Ralph Waldo Trine. "The tender and humane passion in the human heart is too precious a quality to allow it to be hardened or effaced by practices such as we often indulge in." Ralph Waldo Trine. 50 pgs. 5x8. Pbk. ISBN: 0-89540-309-9.